The Letters and Papers of the Clarke, Butler, Doudney and Lenox-Conyngham Families of Maidenhall and Lavistown. ‘Its an ill-wind which brings no good’. 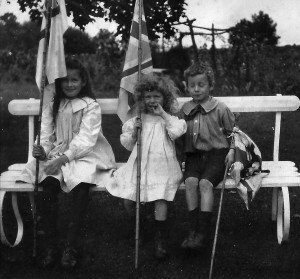 Hubert Butler with his sisters Cicely and Joan at Maidenhall, c. 1905. Many of us, the family and friends of the late Melosina Lenox-Conyngham of Lavistown (1941-2011), who died early in October last year, could see only loss as a result of her early death. Through RTE’s Sunday Miscellany, Melo was known to many. 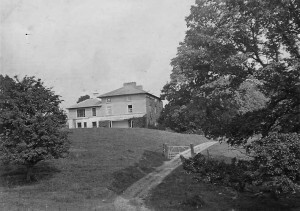 But since then her family, the Lenox-Conyngham’s of Anaverna, Co. Louth, the Grenes of Ballinaclash, Co. Wicklow, the Butlers of Maidenhall and neighbours and close friends, chiefly the Goodwillies of Lavistown House, have given to Kilkenny Archive Ltd., the papers which Melo had carefully preserved which had been collected by her great-grandmother, Mary Elizabeth Pearson Mrs. 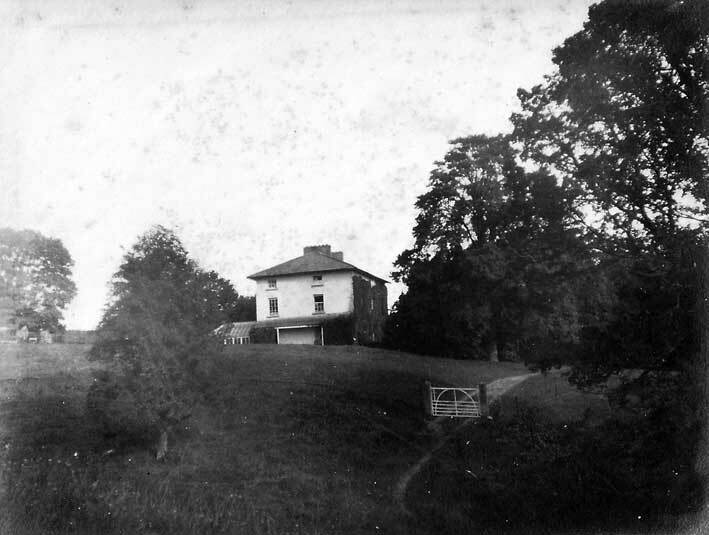 Marshal Clarke of Griaguenoe near Thurles, Co. Tipperary; of her grandmother, Mrs. Harriet (Rita) Butler (née Clarke), wife of George Butler of Maidenhall ; the papers of her great-aunt, Miss Florence Butler (1856-1925) and finally the papers of her aunt, Cicely Butler, later Mrs. Doudney. There are also some letters and papers from the young days of her mother, Joan Butler, later Mrs. G. Lenox-Conyngham of Anaverna, Ravensdale, Co. Louth. The Lenox-Conynghams were tea-planters in Ceylon all during the first half of the twentieth century. The family’s oldest Irish house is the very beautiful Springhill House in northern Ireland, which was given to the National Trust in the 1950s. Mrs. Mary Clarke in her widowhood and old age came to live at Maidenhall with her daughter Harriet, Mrs. George Butler. Here we found amongst other things a series of letters written by her son ‘Otty’, who like many an Irishmen, then and now, had to go abroad for work. Loftus Otway Clarke (1871-1954) to give him his full name, joined the Indian civil service after taking his degree at Christchurch, Oxford. 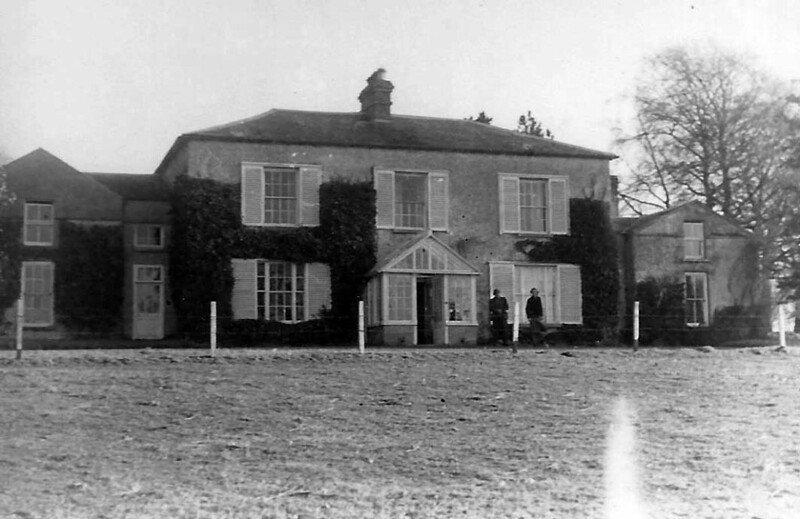 ‘Otty’ corresponded not only with his mother and sister at Maidenhall but also with his nieces and nephews, thus letters written to Hubert, Gilbert, Joan and Cicely Butler are found here. In his letters we find comments on such notable figures as Ghandi, Eamonn De Valera and the latter’s negotiations (through Michael Collins and the team of Irish negotiators) with Lloyd George, which ultimately led to our independence as the Irish Free State. In his letters too we find comments on the Great War. In 1916 he hoped that ‘the Prince Sixtus of Parma (brother-in-law of the Emperor Karl of Austria-Hungary) Peace Negotiations’ would bring European peace, but he was very doubtful, and as it turned out correct. In 1918 when returning to Ireland for an extended holiday, his ship was sunk off Gibralter. In that same year on his return trip to India for his last period of Indian service before retiring his ship was sunk off Brest. He with other survivors spent 17 hours at sea in a very small craft. Here too we find comments on the infamous massacre at Amritszar when British troops under the command of an Irishman, Major Dyer, fired on a crowd of protesters or ‘agitators’ as ‘Otty’ calls them, killing many. From his use of the word ‘agitators’ we can clearly see where his sympathies lay. Dyer was subsequently found guilty of misconduct and had to leave the army in disgrace. But British public opinion was on his side and on his forced resignation and return to the England, a sum in excess of £20,000 was raised by public subscription and presented to him ‘Otty’ too felt that Dyer had been unfairly treated, as his prompt action had quietened the Punjab at a very anxious period. Lotus Otway Clarke spent his last years in India as political agent to the state of Manipur which for him was a very pleasant final posting. Upon his retirement in 1924 he was awarded a C.I.E. (Companion of the Indian Empire). He retired to Radnorshire in Wales where he was a J.P. and High Sheriff for many years. In 1923 his old Tipperary home, Graiguenoe park, near Thurles had been destroyed by fire during ‘the Troubles’. During the 2nd World War he served in the Home Guard. He died in 1954 leaving a son George, who had been largely brought up at Maidenhall, Bennetsbridge, far away from his parents for most of his childhood. During one such period his mother Evelyn, whom he had not seen for many years died after a long illness. The child’s grandmother and aunt had to aid and comfort the motherless nine-year-old boy, whow as quite soon after despatched to school in England. Shortly before her death Evelyn, née Carden of Fishmoyne, Co. Tipperary, sent to George (born 1908) two pen and ink drawings of the view from her bungalow, which showed the distant mountains of the Himilyas and the even more distant Tibet. These have survived with the letter. Amongst the collection too are letters written by Otty’s younger and as it turned out less fortunate brother, Captain George Vernon Clarke, (born 1873) who was killed in the S. African war in April 1902, just as that war was drawing to a close. The Clarkes a long established Tipperary family, subsequently lived at Athgoe Park near Hazelhatch, Co. Kildare. So this one collection has Tipperary, Kildare and Kilkenny place and family associations. Amongst the papers of Cicely Butler, later Mrs. Doudney, are a series of letters written by Cicely back to her mother at Maidenhall, in which she describes various trips abroad including one to Kashmir in 1912. Though travelling continuously it was done in considerable style and most evenings the party were served five course dinners which had been prepared by one of the native bearers, who doubled as a cook. On one stop she met fellow Irishman, Quartermaster Captain Foley. India was full of Irish who went out there not only as soldiers or civil servants but also as doctors, engineers etc. My father’s beloved step-mother, Kitty McDyer, whose family hailed from Donegal – and included the famous Fr. McDyer of Glencomcille – was born in India, and when she came to live in Lower Grange, Goresbridge in 1936 she brought with her many Indian influences including an Indian style bungalow complete with mini-verandahs, which replaced the old two-storey long thatched farm house which was destroyed by fire in May 1940. This ‘new bungalow’ still survives. The great house at Castlemorres, Kilmogany was being dismantled at that time, so slates and timber were purchased there for the re-building. The Butler Society amongst others have agreed to help with the cost of accessioning and boxing this very valuable collection of papers, which could be loosely be described as ‘A tale of two houses by four women’. 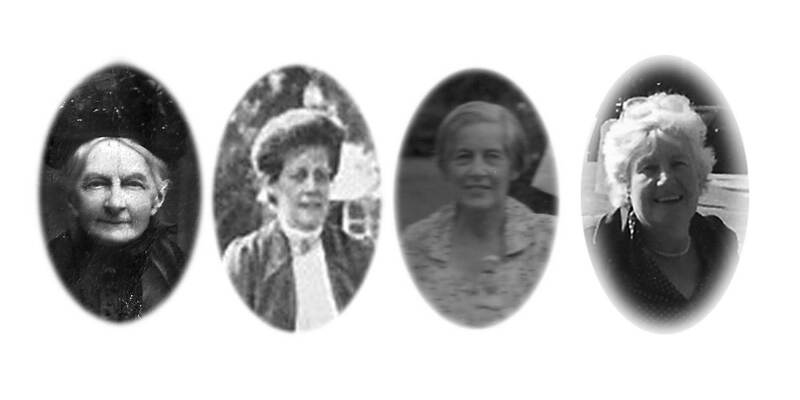 Mary E. Clarke, Harriet N. Butler, Cicely Doudney, Melosina Lenox-Conyngham.